Joppa Charters has been operated by Capt. Dave Rimmer since 2002, when he began began taking anglers out aboard his 22-foot Pathfinder bayboat to fish the Merrimack River, Plum Island beaches and estuaries and the flats of Crane Beach for striped bass and bluefish. Whether drifting the legendary Joppa Flats, chasing surface-feeding fish of Plum Island or sight-fishing the Crane Beach flats, Dave is tuned into this fishery and puts you in the best possible situation to be successful and have a fun outing. His boat is equipped with modern electronic and safety gear, and a quiet, fuel efficient 4-stroke 150 hp Honda motor (repowered in 2013). All the fly and spin gear is provided if necessary and is high quality equipment from Orvis, Loomis, Abel, Tibor and the like. Dave is also an accomplished fly tier and will provide you with custom flies as well as lures and soft baits. Generally there is no bait fishing done. Known as a relentless guide and angler, he will work as hard as possible for you on every charter to find and catch fish, regardless of your skill level. 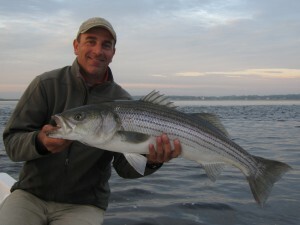 A biologist and conservationist by profession, he also takes great pride in running a largely catch and release operation, especially for striped bass. So don’t wait. Contact Dave and book a charter now!